Today was a hectic day. We started out at 7:30 for the Todaiji Temple in Nara, depositing our bags at the train station en route. 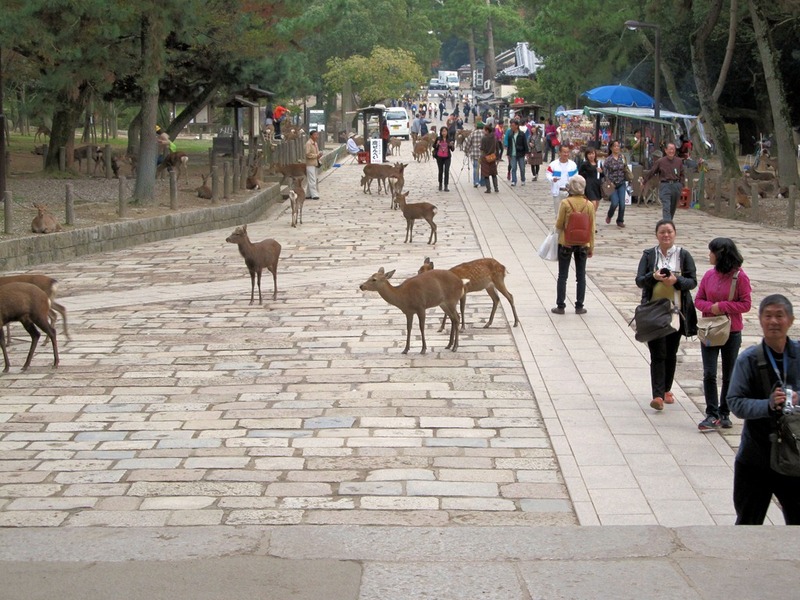 There is much to see in Nara but we were limited to the temple and Nara Park which contains many deer. The temple is the largest wooden structure in the world. 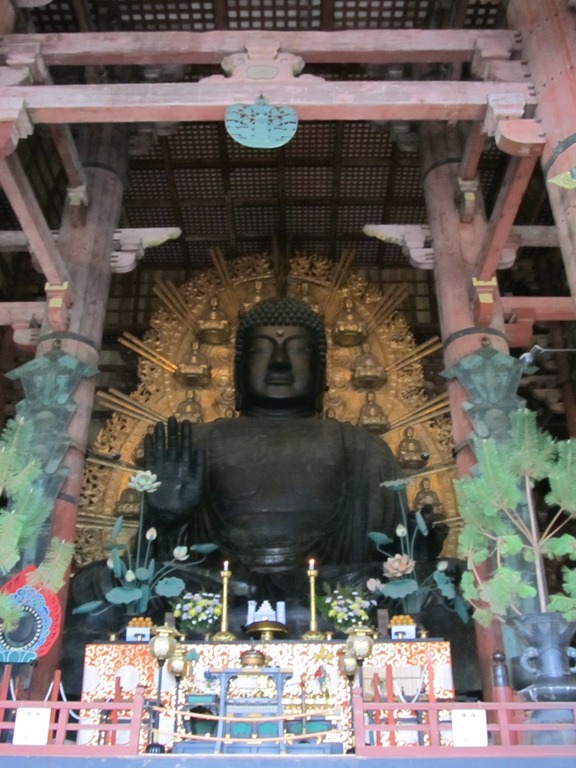 It is famous for its massive statue of Buddha, known as the Daibutsu. It was founded in the 8th century but burned down a couple of times. The present structure was built in 1709. I have a photo of the temple and one of the Buddha. I show the deer begging for food – special deer crackers which can be bought to feed them. Legend has it that when a nearby shrine was founded, the family which established it invited a powerful god to come to the shrine and he arrived on a white deer. There are no white deer but those that are there are respected and protected as divine messengers by the local people. 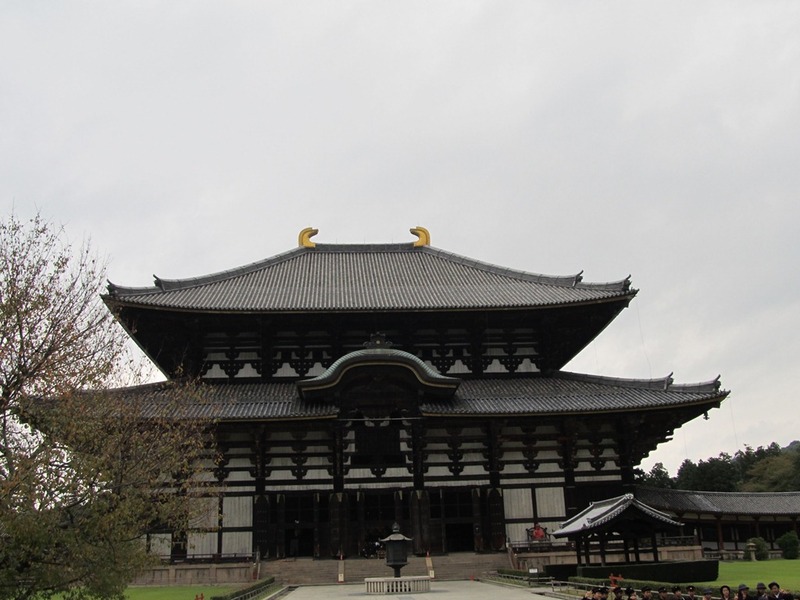 Nara would be worth a return visit and it is easily accessible on a day trip from Kyoto. Three train rides later, including one of those 6 minute connections involving running up and down several steep sets of stairs to change platforms, we were in Hiroshima. We took a tram to our hotel and after checking in, headed out to the Peace Park with our new Japanese guide. Our first stop was the extensive Hiroshima Peace Memorial Museum. This museum describes three sets of events: conditions and events in Hiroshima on August 6, 1945 together with artefacts and other materials; Hiroshima before the bombing and the development of the Atomic bomb to the date of the drop; and, the current status of the nuclear age and Hiroshima’s peace activities. Videos, photos and actual artefacts are used to convey the information. 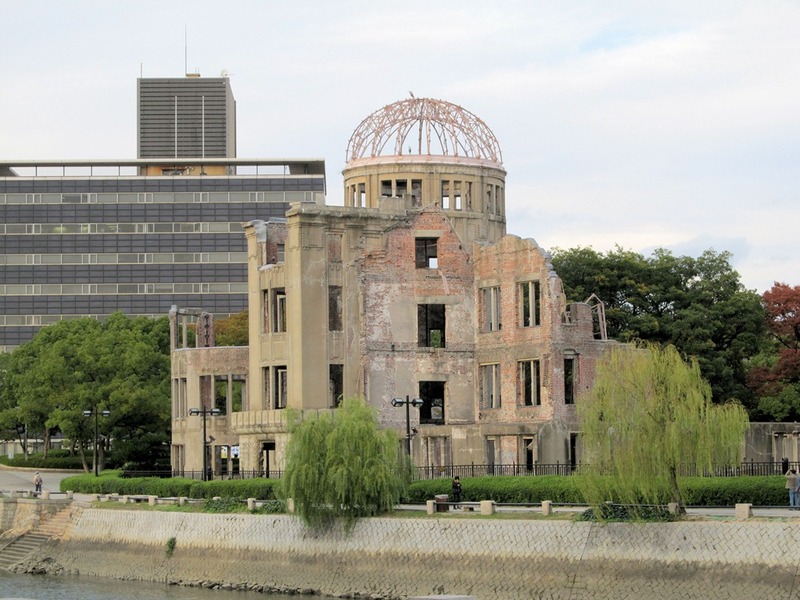 Great emphasis is placed on the peace and anti-nuclear activities centred in Hiroshima. We then went outside into the park and viewed the Cenotaph for the Atomic bomb victims (photo), which contains books listing the names of the dead. Names are continually added as people affected by the bomb die. 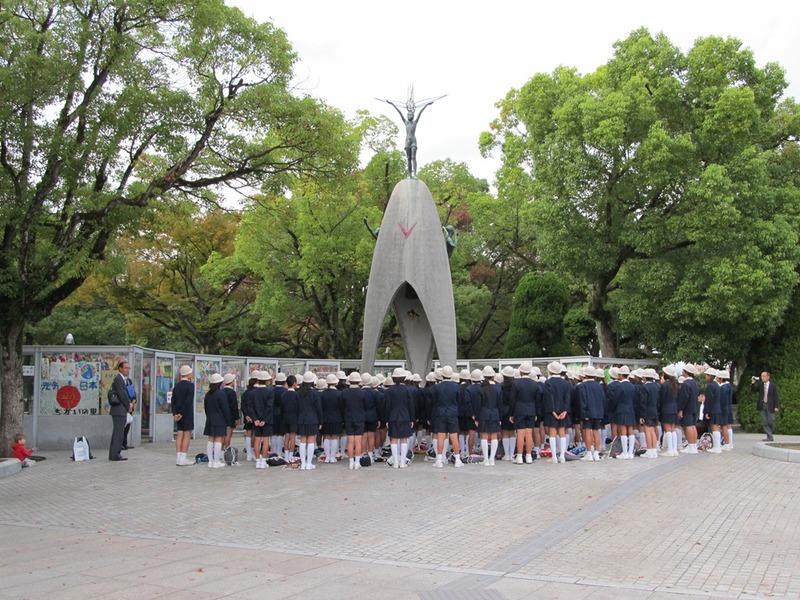 We then walked to the Children’s Peace Monument, established in memory of a young girl who died of leukemia some 8 years after the bomb was dropped. A group of children was having a ceremony at the monument (photo). We then saw the Atomic Bomb Dome, (photo) which is a UNESCO World Heritage site. Tomorrow we conclude our Hiroshima sightseeing and head for Kyoto. 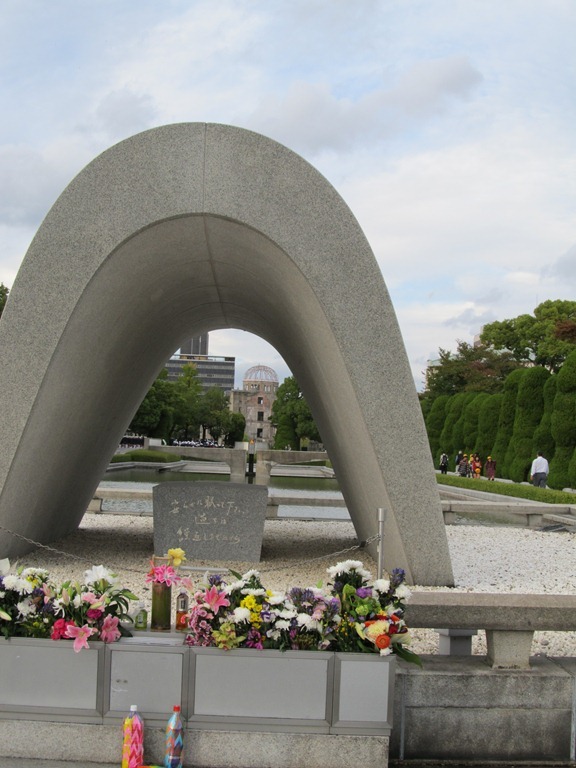 This entry was posted in Travel and tagged Atomic Bomb Dome, Children’s Peace Monument, deer, Hiroshima, Hiroshima Memorial Museum, Hiroshima Peace Park, Nara, Nara Park, Todaiji Temple. Bookmark the permalink. That MUST have been a hectic day, Leslie! I recognize the locations, and am very glad you got to them.